This weekend was Doors Open London, and I was lucky enough to volunteer and meet many of the volunteers working here. It’s been so nice to see what a diverse group of people Banting House brings in, especially as the history of the site is something that appeals to people with a love for history and science. This was my first time really showing people around the house and exhibits, and it was a good way to ease myself into giving tours and talking about the rooms. I had a lot of good conversations with everyone who visited, and I feel more confident about my ability to answer questions on the spot. Many of the people I talked to were surprised by Banting’s paintings, and a bit horrified by his later attempts to test mustard gas on himself. A lot of visitors also had fun looking at the world map we keep in our gift shop, which tracks the various countries people come from. This is one of my favourite parts of the museum as well, as it’s amazing to see how far the discovery of insulin reaches and how much it means to people. This week I’ve continued to look at the collections we have in the Seneshen Gallery. One of the main things I’m trying to do at the moment is to assess the quality of the objects on display, so that we can continue to make sure they are in good condition. This is important for us to maintain the objects in the future, and to identify possible risks and reasons for potential deterioration so we can stop it and ensure the collections are cared for. It’s really interesting to track down where all these commemorative items came from, and how they arrived at Banting House. Next week I’ll be tracking down information about our commemorative coins display. I had a lot of fun helping out with the tours this weekend, and I hope to do a full tour soon! 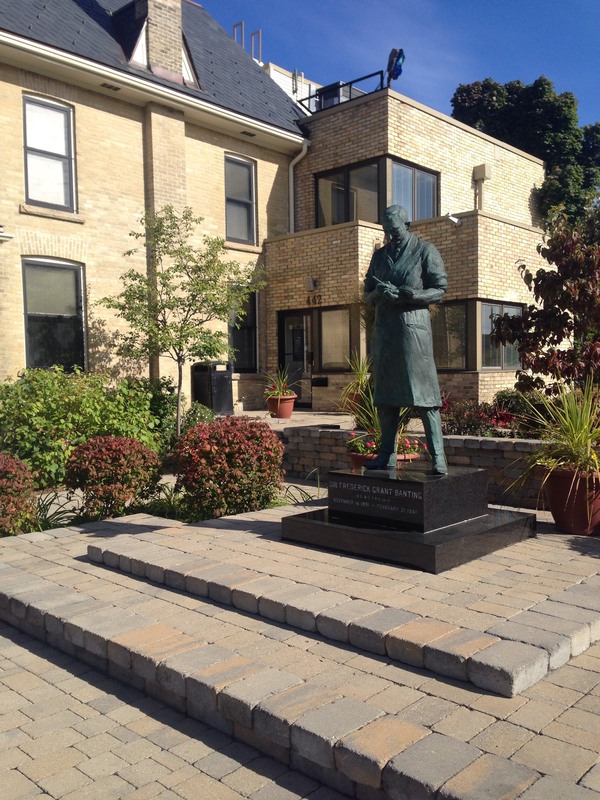 The statue of Frederick Banting greeted many visitors on Doors Open.